Anybody saw these before (Chuckster57)? Just came across them on an Amazon add. Seems like they'd save you a few steps flailing around under a pickup, especially when you get old, stiff, and sore. Link no work on autoguide app, like lots of other problems. IÂ’ll have to check them out when I get home and can look at them on a computer. Quite a novel idea but I would not like to pay for 4 of them when my floor jack and regular jack stands work just as well. One place where it would be nice is is a location where there is really no place to jack up your vehicle and place a jack stand. I have ran into that situation a few times or where there is no room for the base of the jack and base of the jack stand. I might pick up one of them just for those type of situations. Chuck, I think if you go to Amazon then enter "bottle jack with jack stand" it may pop up. Interesting if IÂ’m looking at the right thing. One problem I see for myself is often times the jacking point isnÂ’t near/the same as the jackstand contact point. 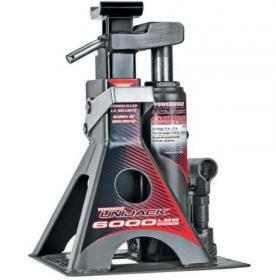 Working in areas where pulling and pushing a large floor jack is not convenient AND when suffering a bad back. You're welcome, and I might spring for 2 for the reasons you guys posted, but I'd like to see one in person first. And here I thought that you would be the beta tester for us. I am actually thinking about one to use on my Explorer for when I rotate the tires. It would be perfect to be able to jack up one tire and then place a jack stand at the same time in the same place. I went back and read a lot of the reviews. It appears that the jack has a problem with it's seals both leaking, and blowing out. At least one person used it to change a flat tire and was in a fix when the seal blew out and was unable to raise it back up to release the jack stand part. He said that he was lucky that he still had the vehicles jack with him. I usually take reviews with a grain of salt but think that I'll let someone else test it out. I've found usually it's not too hard to tell the idiot reviewers from the knowledgeable guys. Too bad if they *are* crappy bottle jacks. We had them at work all the way up to ten and fifteen ton jacks and I don't think we ever had to reseal any of them including my ancient 3 or 5 ton one. I still have a couple of bottle jacks that are quite possibly older that most of the members on the forum here and they just keep working whenever I need them. LMJD and chuckster57 like this. Yup. I finally had to replace my floor jack after 15+ yrs. I too have a bottle jack or two that are still going. I have a HF 2 1/4 ton floor jack that is over 25 years old and besides loosing one of the wheels and a few bearings 11 years ago it is still going strong. It might not see the service that one of chuckster's would but I have used and abused it over the years and it still picks up what I need it to. I just wish that I could get another one just like it and I would be happy for the rest of my wrenching life. My floor jack was HF. Broke the spring that kept the handle up about 10 yrs ago. Only reason for replacement was it leaked down too fast to put a jackstand in place. Well, I never bought any of the pump jackstands, but I did buy an air powered bottle jack a couple weeks ago. It's heavy but that's expected, no way to make something like that light. Used it on both front sides of my pickup to set jack stands for steering gear adjustment a while back. Worked well and I think I'll be glad I bought it. It's a Torin Big Red 20 ton capacity. The 20 ton wasn't that much more than the 12. Last edited by LMJD; 09-24-2018 at 02:23 PM.